Designed for board-to-board connections in literally thousands of electronic systems, FFC cable is usually made up of flat tin or gold plated copper conductors insulated with polyester or polyimide tapes. From 0.30 mm pitch up to a larger 2.54mm pitch, Flexible Flat Cable truly earns its ‘flexible’ name, suitable for the most diverse applications. FFC cables are manufactured in one of two ways, either by hot lamination or an extrusion process. 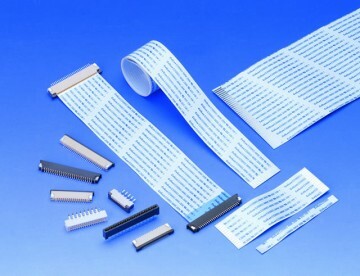 In hot lamination, two adhesive coated films with parallel strips laid at defined pitches are pressed together while the extrusion technique coats the metal strips in a thermoplastic outer skin. Versatility in application comes from its high resistance to vibration, low weight advantage, thermal resistance and fracture-safety. Suitable for safety applications such as air-bags in the automotive world, FFC also offers better EMI/RFI suppression. In addition, these flat cables can be easily custom-shaped to fit tight, unusual spaces leading to their use in aircraft and modern warships. Cabling expenditure in the automotive industry, has significantly increased due to the rapidly growing number of electronic safety and convenience functions. FFC cables are used in the industry for safety relevant components as well as for components that enhance the driving experience through comfort or entertainment. Their low structural volume gives the manufacturer strength and reliability of connectivity without adding weight. Another advantage is that, in contrast to conventional twisted round cables, FFC can be installed and manipulated with handling gear or robotic manufacturing devices and wiring errors can be avoided in complex configurations. Leotronics offer a large range of different FFC cable solutions. Contact us to see how we can enhance your product design with our versatile bespoke cables. Check out our competitive pricing and lead times to ensure you get the best from your components.